The Neolithic (/ˌniːəˈlɪθɪk/ ( listen), also known as the "New Stone Age"), the final division of the Stone Age, began about 12,000 years ago when the first development of farming appeared in the Epipalaeolithic Near East, and later in other parts of the world. The division lasted until the transitional period of the Chalcolithic from about 6,500 years ago (4500 BC), marked by the development of metallurgy, leading up to the Bronze Age and Iron Age. In Northern Europe, the Neolithic lasted until about 1700 BC, while in China it extended until 1200 BC. Other parts of the world (including the New World) remained broadly in the Neolithic stage of development, although this term may not be used, until European contact. The term Neolithic derives from the Greek νέος néos, "new" and λίθος líthos, "stone", literally meaning "New Stone Age". The term was coined by Sir John Lubbock in 1865 as a refinement of the three-age system. Approximate centers of origin of agriculture in the Neolithic revolution and its spread in prehistory: the Fertile Crescent (11,000 BP), the Yangtze and Yellow River basins (9,000 BP) and the New Guinea Highlands (9,000–6,000 BP), Central Mexico (5,000–4,000 BP), Northern South America (5,000–4,000 BP), sub-Saharan Africa (5,000–4,000 BP, exact location unknown), eastern North America (4,000–3,000 BP). Following the ASPRO chronology, the Neolithic started in around 10,200 BC in the Levant, arising from the Natufian culture, when pioneering use of wild cereals evolved into early farming. The Natufian period or "proto-Neolithic" lasted from 12,500 to 9,500 BC, and is taken to overlap with the Pre-Pottery Neolithic (PPNA) of 10,200–8800 BC. As the Natufians had become dependent on wild cereals in their diet, and a sedentary way of life had begun among them, the climatic changes associated with the Younger Dryas (about 10,000 BC) are thought to have forced people to develop farming. By 10,200–8800 BC farming communities had arisen in the Levant and spread to Asia Minor, North Africa and North Mesopotamia. Mesopotamia is the site of the earliest developments of the Neolithic Revolution from around 10,000 BC. Not all of these cultural elements characteristic of the Neolithic appeared everywhere in the same order: the earliest farming societies in the Near East did not use pottery. In other parts of the world, such as Africa, South Asia and Southeast Asia, independent domestication events led to their own regionally distinctive Neolithic cultures, which arose completely independently of those in Europe and Southwest Asia. Early Japanese societies and other East Asian cultures used pottery before developing agriculture. In the Middle East, cultures identified as Neolithic began appearing in the 10th millennium BC. Early development occurred in the Levant (e.g., Pre-Pottery Neolithic A and Pre-Pottery Neolithic B) and from there spread eastwards and westwards. 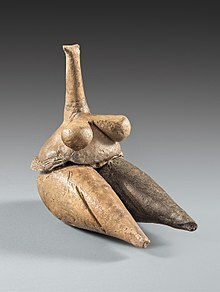 Neolithic cultures are also attested in southeastern Anatolia and northern Mesopotamia by around 8000 BC. The prehistoric Beifudi site near Yixian in Hebei Province, China, contains relics of a culture contemporaneous with the Cishan and Xinglongwa cultures of about 6000–5000 BC, neolithic cultures east of the Taihang Mountains, filling in an archaeological gap between the two Northern Chinese cultures. The total excavated area is more than 1,200 square yards (1,000 m2; 0.10 ha), and the collection of neolithic findings at the site encompasses two phases. The Neolithic 1 (PPNA) period began roughly around 10,000 BC in the Levant. A temple area in southeastern Turkey at Göbekli Tepe, dated to around 9500 BC, may be regarded as the beginning of the period. This site was developed by nomadic hunter-gatherer tribes, as evidenced by the lack of permanent housing in the vicinity, and may be the oldest known human-made place of worship. At least seven stone circles, covering 25 acres (10 ha), contain limestone pillars carved with animals, insects, and birds. 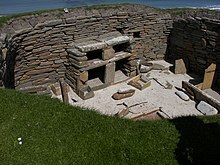 Stone tools were used by perhaps as many as hundreds of people to create the pillars, which might have supported roofs. Other early PPNA sites dating to around 9500–9000 BC have been found in Jericho, West Bank (notably Ain Mallaha, Nahal Oren, and Kfar HaHoresh), Gilgal in the Jordan Valley, and Byblos, Lebanon. The start of Neolithic 1 overlaps the Tahunian and Heavy Neolithic periods to some degree. The major advance of Neolithic 1 was true farming. In the proto-Neolithic Natufian cultures, wild cereals were harvested, and perhaps early seed selection and re-seeding occurred. The grain was ground into flour. Emmer wheat was domesticated, and animals were herded and domesticated (animal husbandry and selective breeding). In 2006, remains of figs were discovered in a house in Jericho dated to 9400 BC. The figs are of a mutant variety that cannot be pollinated by insects, and therefore the trees can only reproduce from cuttings. This evidence suggests that figs were the first cultivated crop and mark the invention of the technology of farming. This occurred centuries before the first cultivation of grains. Settlements became more permanent, with circular houses, much like those of the Natufians, with single rooms. However, these houses were for the first time made of mudbrick. The settlement had a surrounding stone wall and perhaps a stone tower (as in Jericho). The wall served as protection from nearby groups, as protection from floods, or to keep animals penned. Some of the enclosures also suggest grain and meat storage. The Neolithic 2 (PPNB) began around 8800 BC according to the ASPRO chronology in the Levant (Jericho, Palestine). As with the PPNA dates, there are two versions from the same laboratories noted above. This system of terminology, however, is not convenient for southeast Anatolia and settlements of the middle Anatolia basin. A settlement of 3,000 inhabitants was found in the outskirts of Amman, Jordan. Considered to be one of the largest prehistoric settlements in the Near East, called 'Ain Ghazal, it was continuously inhabited from approximately 7250 BC to approximately 5000 BC. Settlements have rectangular mud-brick houses where the family lived together in single or multiple rooms. Burial findings suggest an ancestor cult where people preserved skulls of the dead, which were plastered with mud to make facial features. The rest of the corpse could have been left outside the settlement to decay until only the bones were left, then the bones were buried inside the settlement underneath the floor or between houses. The Neolithic 3 (PN) began around 6,400 BC in the Fertile Crescent. By then distinctive cultures emerged, with pottery like the Halafian (Turkey, Syria, Northern Mesopotamia) and Ubaid (Southern Mesopotamia). This period has been further divided into PNA (Pottery Neolithic A) and PNB (Pottery Neolithic B) at some sites. The Chalcolithic (Stone-Bronze) period began about 4500 BC, then the Bronze Age began about 3500 BC, replacing the Neolithic cultures. Around 10,000 BC the first fully developed Neolithic cultures belonging to the phase Pre-Pottery Neolithic A (PPNA) appeared in the Fertile Crescent. Around 10,700–9400 BC a settlement was established in Tell Qaramel, 10 miles (16 km) north of Aleppo. The settlement included two temples dating to 9650 BC. Around 9000 BC during the PPNA, one of the world's first towns, Jericho, appeared in the Levant. It was surrounded by a stone wall and contained a population of 2,000–3,000 people and a massive stone tower. Around 6400 BC the Halaf culture appeared in Syria and Northern Mesopotamia. In 1981 a team of researchers from the Maison de l'Orient et de la Méditerranée, including Jacques Cauvin and Oliver Aurenche divided Near East neolithic chronology into ten periods (0 to 9) based on social, economic and cultural characteristics. In 2002 Danielle Stordeur and Frédéric Abbès advanced this system with a division into five periods. A PPNB (sometimes called PPNC) transitional stage (PPNB final) in which Halaf and dark faced burnished ware begin to emerge between 6900 and 6400 BC. They also advanced the idea of a transitional stage between the PPNA and PPNB between 8800 and 8600 BC at sites like Jerf el Ahmar and Tell Aswad. Alluvial plains (Sumer/Elam). Low rainfall makes irrigation systems necessary. Ubaid culture from 6,900 BC. Domestication of sheep and goats reached Egypt from the Near East possibly as early as 6000 BC. Graeme Barker states "The first indisputable evidence for domestic plants and animals in the Nile valley is not until the early fifth millennium BC in northern Egypt and a thousand years later further south, in both cases as part of strategies that still relied heavily on fishing, hunting, and the gathering of wild plants" and suggests that these subsistence changes were not due to farmers migrating from the Near East but was an indigenous development, with cereals either indigenous or obtained through exchange. Other scholars argue that the primary stimulus for agriculture and domesticated animals (as well as mud-brick architecture and other Neolithic cultural features) in Egypt was from the Middle East. In southeast Europe agrarian societies first appeared in the 7th millennium BC, attested by one of the earliest farming sites of Europe, discovered in Vashtëmi, southeastern Albania and dating back to 6500 BC. In Northwest Europe it is much later, typically lasting just under 3,000 years from c. 4500 BC–1700 BC. 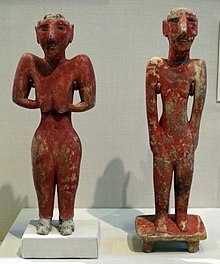 Anthropomorphic figurines have been found in the Balkans from 6000 BC, and in Central Europe by around 5800 BC (La Hoguette). Among the earliest cultural complexes of this area are the Sesklo culture in Thessaly, which later expanded in the Balkans giving rise to Starčevo-Körös (Cris), Linearbandkeramik, and Vinča. Through a combination of cultural diffusion and migration of peoples, the Neolithic traditions spread west and northwards to reach northwestern Europe by around 4500 BC. The Vinča culture may have created the earliest system of writing, the Vinča signs, though archaeologist Shan Winn believes they most likely represented pictograms and ideograms rather than a truly developed form of writing. The Cucuteni-Trypillian culture built enormous settlements in Romania, Moldova and Ukraine from 5300 to 2300 BC. The megalithic temple complexes of Ġgantija on the Mediterranean island of Gozo (in the Maltese archipelago) and of Mnajdra (Malta) are notable for their gigantic Neolithic structures, the oldest of which date back to around 3600 BC. The Hypogeum of Ħal-Saflieni, Paola, Malta, is a subterranean structure excavated around 2500 BC; originally a sanctuary, it became a necropolis, the only prehistoric underground temple in the world, and shows a degree of artistry in stone sculpture unique in prehistory to the Maltese islands. After 2500 BC, these islands were depopulated for several decades until the arrival of a new influx of Bronze Age immigrants, a culture that cremated its dead and introduced smaller megalithic structures called dolmens to Malta. In most cases there are small chambers here, with the cover made of a large slab placed on upright stones. They are claimed to belong to a population different from that which built the previous megalithic temples. It is presumed the population arrived from Sicily because of the similarity of Maltese dolmens to some small constructions found there. The earliest Neolithic sites in South Asia are Bhirrana in Haryana dated to 7570-6200 BC, and Mehrgarh, dated to between 6500 and 5500 BC, in the Kachi plain of Baluchistan, Pakistan; the site has evidence of farming (wheat and barley) and herding (cattle, sheep and goats). In South India, the Neolithic began by 6500 BC and lasted until around 1400 BC when the Megalithic transition period began. South Indian Neolithic is characterized by Ash mounds[clarification needed] from 2500 BC in Karnataka region, expanded later to Tamil Nadu. In East Asia, the earliest sites include the Nanzhuangtou culture around 9500–9000 BC, Pengtoushan culture around 7500–6100 BC, and Peiligang culture around 7000–5000 BC. The 'Neolithic' (defined in this paragraph as using polished stone implements) remains a living tradition in small and extremely remote and inaccessible pockets of West Papua (Indonesian New Guinea). Polished stone adze and axes are used in the present day (as of 2008[update]) in areas where the availability of metal implements is limited. This is likely to cease altogether in the next few years as the older generation die off and steel blades and chainsaws prevail. In 2012, news was released about a new farming site discovered in Munam-ri, Goseong, Gangwon Province, South Korea, which may be the earliest farmland known to date in east Asia. "No remains of an agricultural field from the Neolithic period have been found in any East Asian country before, the institute said, adding that the discovery reveals that the history of agricultural cultivation at least began during the period on the Korean Peninsula". The farm was dated between 3600 and 3000 BC. Pottery, stone projectile points, and possible houses were also found. "In 2002, researchers discovered prehistoric earthenware, jade earrings, among other items in the area". The research team will perform accelerator mass spectrometry (AMS) dating to retrieve a more precise date for the site. In Mesoamerica, a similar set of events (i.e., crop domestication and sedentary lifestyles) occurred by around 4500 BC, but possibly as early as 11,000–10,000 BC. These cultures are usually not referred to as belonging to the Neolithic; in America different terms are used such as Formative stage instead of mid-late Neolithic, Archaic Era instead of Early Neolithic and Paleo-Indian for the preceding period. The Formative stage is equivalent to the Neolithic Revolution period in Europe, Asia, and Africa. In the southwestern United States it occurred from 500 to 1200 AD when there was a dramatic increase in population and development of large villages supported by agriculture based on dryland farming of maize, and later, beans, squash, and domesticated turkeys. During this period the bow and arrow and ceramic pottery were also introduced. In later periods cities of considerable size developed, and some metallurgy by 700 BCE. Australia, in contrast to New Guinea, has generally been held not to have had a Neolithic period, with a hunter-gatherer lifestyle continuing until the arrival of Europeans. This view can be challenged in terms of the definition of agriculture, but "Neolithic" remains a rarely-used and not very useful concept in discussing Australian prehistory. During most of the Neolithic age of Eurasia, people lived in small tribes composed of multiple bands or lineages. There is little scientific evidence of developed social stratification in most Neolithic societies; social stratification is more associated with the later Bronze Age. Although some late Eurasian Neolithic societies formed complex stratified chiefdoms or even states, generally states evolved in Eurasia only with the rise of metallurgy, and most Neolithic societies on the whole were relatively simple and egalitarian. Beyond Eurasia, however, states were formed during the local Neolithic in three areas, namely in the Preceramic Andes with the Norte Chico Civilization, Formative Mesoamerica and Ancient Hawaiʻi. However, most Neolithic societies were noticeably more hierarchical than the Upper Paleolithic cultures that preceded them and hunter-gatherer cultures in general. The domestication of large animals (c. 8000 BC) resulted in a dramatic increase in social inequality in most of the areas where it occurred; New Guinea being a notable exception. Possession of livestock allowed competition between households and resulted in inherited inequalities of wealth. Neolithic pastoralists who controlled large herds gradually acquired more livestock, and this made economic inequalities more pronounced. However, evidence of social inequality is still disputed, as settlements such as Catal Huyuk reveal a striking lack of difference in the size of homes and burial sites, suggesting a more egalitarian society with no evidence of the concept of capital, although some homes do appear slightly larger or more elaborately decorated than others. Families and households were still largely independent economically, and the household was probably the center of life. However, excavations in Central Europe have revealed that early Neolithic Linear Ceramic cultures ("Linearbandkeramik") were building large arrangements of circular ditches between 4800 and 4600 BC. These structures (and their later counterparts such as causewayed enclosures, burial mounds, and henge) required considerable time and labour to construct, which suggests that some influential individuals were able to organise and direct human labour — though non-hierarchical and voluntary work remain possibilities. There is a large body of evidence for fortified settlements at Linearbandkeramik sites along the Rhine, as at least some villages were fortified for some time with a palisade and an outer ditch. Settlements with palisades and weapon-traumatized bones, such as those found at the Talheim Death Pit, have been discovered and demonstrate that "...systematic violence between groups" and warfare was probably much more common during the Neolithic than in the preceding Paleolithic period. This supplanted an earlier view of the Linear Pottery Culture as living a "peaceful, unfortified lifestyle". Control of labour and inter-group conflict is characteristic of tribal groups with social rank that are headed by a charismatic individual — either a 'big man' or a proto-chief — functioning as a lineage-group head. Whether a non-hierarchical system of organization existed is debatable, and there is no evidence that explicitly suggests that Neolithic societies functioned under any dominating class or individual, as was the case in the chiefdoms of the European Early Bronze Age. Theories to explain the apparent implied egalitarianism of Neolithic (and Paleolithic) societies have arisen, notably the Marxist concept of primitive communism. The shelter of the early people changed dramatically from the Upper Paleolithic to the Neolithic era. In the Paleolithic, people did not normally live in permanent constructions. In the Neolithic, mud brick houses started appearing that were coated with plaster. The growth of agriculture made permanent houses possible. Doorways were made on the roof, with ladders positioned both on the inside and outside of the houses. The roof was supported by beams from the inside. The rough ground was covered by platforms, mats, and skins on which residents slept. Stilt-houses settlements were common in the Alpine and Pianura Padana (Terramare) region. Remains have been found at the Ljubljana Marshes in Slovenia and at the Mondsee and Attersee lakes in Upper Austria, for example. A significant and far-reaching shift in human subsistence and lifestyle was to be brought about in areas where crop farming and cultivation were first developed: the previous reliance on an essentially nomadic hunter-gatherer subsistence technique or pastoral transhumance was at first supplemented, and then increasingly replaced by, a reliance upon the foods produced from cultivated lands. These developments are also believed to have greatly encouraged the growth of settlements, since it may be supposed that the increased need to spend more time and labor in tending crop fields required more localized dwellings. This trend would continue into the Bronze Age, eventually giving rise to permanently settled farming towns, and later cities and states whose larger populations could be sustained by the increased productivity from cultivated lands. The profound differences in human interactions and subsistence methods associated with the onset of early agricultural practices in the Neolithic have been called the Neolithic Revolution, a term coined in the 1920s by the Australian archaeologist Vere Gordon Childe. One potential benefit of the development and increasing sophistication of farming technology was the possibility of producing surplus crop yields, in other words, food supplies in excess of the immediate needs of the community. Surpluses could be stored for later use, or possibly traded for other necessities or luxuries. Agricultural life afforded securities that nomadic life could not, and sedentary farming populations grew faster than nomadic. However, early farmers were also adversely affected in times of famine, such as may be caused by drought or pests. In instances where agriculture had become the predominant way of life, the sensitivity to these shortages could be particularly acute, affecting agrarian populations to an extent that otherwise may not have been routinely experienced by prior hunter-gatherer communities. Nevertheless, agrarian communities generally proved successful, and their growth and the expansion of territory under cultivation continued. Another significant change undergone by many of these newly agrarian communities was one of diet. Pre-agrarian diets varied by region, season, available local plant and animal resources and degree of pastoralism and hunting. Post-agrarian diet was restricted to a limited package of successfully cultivated cereal grains, plants and to a variable extent domesticated animals and animal products. Supplementation of diet by hunting and gathering was to variable degrees precluded by the increase in population above the carrying capacity of the land and a high sedentary local population concentration. In some cultures, there would have been a significant shift toward increased starch and plant protein. The relative nutritional benefits and drawbacks of these dietary changes and their overall impact on early societal development are still debated. In addition, increased population density, decreased population mobility, increased continuous proximity to domesticated animals, and continuous occupation of comparatively population-dense sites would have altered sanitation needs and patterns of disease. The identifying characteristic of Neolithic technology is the use of polished or ground stone tools, in contrast to the flaked stone tools used during the Paleolithic era. Neolithic people were skilled farmers, manufacturing a range of tools necessary for the tending, harvesting and processing of crops (such as sickle blades and grinding stones) and food production (e.g. pottery, bone implements). They were also skilled manufacturers of a range of other types of stone tools and ornaments, including projectile points, beads, and statuettes. But what allowed forest clearance on a large scale was the polished stone axe above all other tools. Together with the adze, fashioning wood for shelter, structures and canoes for example, this enabled them to exploit their newly won farmland. Neolithic peoples in the Levant, Anatolia, Syria, northern Mesopotamia and Central Asia were also accomplished builders, utilizing mud-brick to construct houses and villages. At Çatalhöyük, houses were plastered and painted with elaborate scenes of humans and animals. In Europe, long houses built from wattle and daub were constructed. Elaborate tombs were built for the dead. These tombs are particularly numerous in Ireland, where there are many thousand still in existence. Neolithic people in the British Isles built long barrows and chamber tombs for their dead and causewayed camps, henges, flint mines and cursus monuments. It was also important to figure out ways of preserving food for future months, such as fashioning relatively airtight containers, and using substances like salt as preservatives. The peoples of the Americas and the Pacific mostly retained the Neolithic level of tool technology until the time of European contact. Exceptions include copper hatchets and spearheads in the Great Lakes region. Most clothing appears to have been made of animal skins, as indicated by finds of large numbers of bone and antler pins that are ideal for fastening leather. Wool cloth and linen might have become available during the later Neolithic, as suggested by finds of perforated stones that (depending on size) may have served as spindle whorls or loom weights. The clothing worn in the Neolithic Age might be similar to that worn by Ötzi the Iceman, although he was not Neolithic (since he belonged to the later Copper age). Oaxaca, state Southwestern Mexico 2000 by 2000 BC Neolithic sedentary villages had been established in the Central Valleys region of this state. The world's oldest known engineered roadway, the Sweet Track in England, dates from 3800 BC and the world's oldest freestanding structure is the neolithic temple of Ġgantija in Gozo, Malta. Note: Dates are very approximate, and are only given for a rough estimate; consult each culture for specific time periods. Periodization: The Levant: 9500–8000 BC; Europe: 5000–4000 BC; Elsewhere: varies greatly, depending on region. Periodization: The Levant: 8000–6000 BC; Europe: 4000–3500 BC; Elsewhere: varies greatly, depending on region. Jinsha settlement and Sanxingdui mound. Goseck circle, Circular ditches, et al. Periodization: 6500–4500 BC; Europe: 3500–3000 BC; Elsewhere: varies greatly, depending on region. Periodization: Near East: 4500–3300 BC; Europe: 3000–1700 BC; Elsewhere: varies greatly, depending on region. In the Americas, the Eneolithic ended as late as the 19th century AD for some peoples. ^ Some archaeologists have long advocated replacing "Neolithic" with a more descriptive term, such as "Early Village Communities", but this has not gained wide acceptance. ^ The potter's wheel was a later refinement that revolutionized pottery-making. ^ "Neolithic: definition of Neolithic in Oxford dictionary (British & World English)". ^ Habu, Junko (2004). Ancient Jomon of Japan. p. 3. ISBN 978-0-521-77670-7. ^ Xiaohong Wu. "Early Pottery at 20,000 Years Ago in Xianrendong Cave, China". Sciencemag.org. Retrieved 15 January 2015. ^ "New Archaeological Discoveries and Researches in 2004 — The Fourth Archaeology Forum of CASS". Institute of Archaeology, Chinese Academy of Social Sciences. April 28, 2005. Retrieved September 18, 2007. ^ Scham, Sandra (November 2008). "The World's First Temple". Archaeology. Archaeological Institute of America. 61 (6): 23. ^ Kislev, Mordechai E.; Hartmann, Anat; Bar-Yosef, Ofer (June 2, 2006). "Early Domesticated Fig in the Jordan Valley". Science. American Association for the Advancement of Science. 312 (5778): 1372–1374. doi:10.1126/science.1125910. PMID 16741119. ^ Feldman, Keffie. "Ain-Ghazal (Jordan) Pre-pottery Neolithic B Period pit of lime plaster human figures". Joukowsky Institute for Archaeology and the Ancient World. Brown University. Retrieved March 9, 2018. ^ Killebrew, Ann E.; Steiner, Margreet; Goring-Morris, A. Nigel; Belfer-Cohen, Anna (2013-11-01). "The Southern Levant (Cisjordan) During the Neolithic Period". The Oxford Handbook of the Archaeology of the Levant. doi:10.1093/oxfordhb/9780199212972.013.011. ISBN 9780199212972. ^ Forever, Pottery. "Pottery in the Neolithic Age". 5amily. Retrieved 2018-11-14. ^ Haïdar Boustani, M., The Neolithic of Lebanon in the context of the Near East: State of knowledge (in French), Annales d'Histoire et d'Archaeologie, Universite Saint-Joseph, Beyrouth, Vol. 12–13, 2001–2002. Retrieved on 2011-12-03. ^ PPND – the Platform for Neolithic Radiocarbon Dates – Summary. exoriente. Retrieved on 2011-12-03. ^ Linseele, V.; et al. (July 2010). "Sites with Holocene dung deposits in the Eastern Desert of Egypt: Visited by herders?" (PDF). Journal of Arid Environments. 74 (7): 818–828. doi:10.1016/j.jaridenv.2009.04.014. ^ Hays, Jeffrey (March 2011). "EARLY DOMESTICATED ANIMALS". Facts and Details. Archived from the original on 21 October 2013. Retrieved 5 September 2013. ^ Blench, Roger; MacDonald, Kevin C (1999). The Origins and Development of African Livestock. Routledge. ISBN 978-1-84142-018-9. ^ Barker, Graeme (25 March 2009). The Agricultural Revolution in Prehistory: Why Did Foragers Become Farmers?. Oxford University Press. pp. 292–293. ISBN 978-0-19-955995-4. Retrieved 3 December 2011. ^ Alexandra Y. Aĭkhenvalʹd; Robert Malcolm Ward Dixon (2006). Areal Diffussion and Genetic Inheritance: Problems in Comparative Linguistics. Oxford University Press, USA. p. 35. ISBN 978-0-19-928308-8. ^ Fekri A. Hassan (2002). Droughts, food and culture: ecological change and food security in Africa's later prehistory. Springer. pp. 164–. ISBN 978-0-306-46755-4. Retrieved 3 December 2011. ^ Shillington, Kevin (2005). Encyclopedia of African history: A-G. CRC Press. pp. 521–. ISBN 978-1-57958-245-6. Retrieved 3 December 2011. ^ Dawn Fuller (April 16, 2012). "UC research reveals one of the earliest farming sites in Europe". Phys.org. Retrieved April 18, 2012. ^ "One of Earliest Farming Sites in Europe Discovered". ScienceDaily. April 16, 2012. Retrieved April 18, 2012. ^ Female figurine, c. 6000 BC, Nea Nikomidia, Macedonia, Veroia, (Archaeological Museum), Greece. Macedonian-heritage.gr. Retrieved on 2011-12-03. ^ Winn, Shan (1981). Pre-writing in Southeastern Europe: The Sign System of the Vinča Culture ca. 4000 BC. Calgary: Western Publishers. ^ Coningham, Robin; Young, Ruth (2015). The Archaeology of South Asia: From the Indus to Asoka, c.6500 BCE–200 CE. Cambridge University Press Cambridge World Archeology. p. 111. ISBN 9781316418987. ^ Eleni Asouti and Dorian Q Fuller (2007). TREES AND WOODLANDS OF SOUTH INDIA: ARCHAEOLOGICAL PERSPECTIVES. ^ Xiaoyan Yang (2012). "Early millet use in northern China". Proceedings of the National Academy of Sciences. 109 (10): 3726–3730. doi:10.1073/pnas.1115430109. PMC 3309722. PMID 22355109. Retrieved 15 January 2015. ^ The Archaeology News Network. 2012. "Neolithic farm field found in South Korea". ^ The Korea Times (2012). "East Asia's oldest remains of agricultural field found in Korea". ^ Willey, Gordon R.; Phillips, Philip (1957). Method and Theory in American Archaeology. University of Chicago Press. ISBN 978-0-226-89888-9. ^ A. Eichler, G. Gramlich, T. Kellerhals, L. Tobler, Th. Rehren & M. Schwikowski (2017). "Ice-core evidence of earliest extensive copper metallurgy in the Andes 2700 years ago"
^ a b Leonard D. Katz Rigby; S. Stephen Henry Rigby (2000). Evolutionary Origins of Morality: Cross-disciplinary Perspectives. United kingdom: Imprint Academic. p. 158. ISBN 0-7190-5612- 8. ^ Langer, Jonas; Killen, Melanie (1998). Piaget, evolution, and development. Psychology Press. pp. 258–. ISBN 978-0-8058-2210-6. Retrieved 3 December 2011. ^ "The Oldest Civilization in the Americas Revealed" (PDF). CharlesMann. Science. Retrieved 9 October 2015. ^ "First Andes Civilization Explored". BBC News. 22 December 2004. Retrieved 9 October 2015. ^ Hommon, Robert J. (2013). The ancient Hawaiian state: origins of a political society (First ed.). New York: Oxford University Press. ISBN 978-0-19-991612-2. ^ "Stone Age," Microsoft Encarta Online Encyclopedia 2007 © 1997–2007 Microsoft Corporation. All Rights Reserved. Contributed by Kathy Schick, B.A., M.A., Ph.D. and Nicholas Toth, B.A., M.A., Ph.D. Archived 2009-11-01. ^ a b Russell Dale Guthrie (2005). The nature of Paleolithic art. University of Chicago Press. pp. 420–. ISBN 978-0-226-31126-5. Retrieved 3 December 2011. ^ "Farming Pioneered in Ancient New Guinea". New Scientist. New Scientist. Retrieved 9 October 2015. ^ "Prehistoric Cultures". Museum of Ancient and Modern Art. 2010. Retrieved 5 September 2013. ^ Hirst, K. Kris. "Çatalhöyük: Urban Life in Neolithic Anatolia". About.com Archaeology. About.com. Retrieved 5 September 2013. ^ Idyllic Theory of Goddess Creates Storm Archived 2008-02-19 at the Wayback Machine. Holysmoke.org. Retrieved on 2011-12-03. ^ Kuijt, Ian (30 June 2000). Life in Neolithic farming communities: social organization, identity, and differentiation. Springer. pp. 317–. ISBN 978-0-306-46122-4. Retrieved 3 December 2011. ^ a b Shane, Orrin C. III, and Mine Küçuk. "The World's First City." Archived 2008-03-15 at the Wayback Machine Archaeology 51.2 (1998): 43–47. ^ Barber, E. J. W. (1991). Prehistoric Textiles:The Development of Cloth in the Neolithic and Bronze Ages with Special Reference to the Aegean. Princeton University Press. ISBN 978-0-691-00224-8. ^ Alan W. Ertl (15 August 2008). Toward an Understanding of Europe: A Political Economic Précis of Continental Integration. Universal-Publishers. p. 308. ISBN 978-1-59942-983-0. Retrieved 28 March 2011. ^ Harris, Susanna (2009). "Smooth and Cool, or Warm and Soft: Investigating the Properties of Cloth in Prehistory". North European Symposium for Archaeological Textiles X. Academia.edu. Retrieved 5 September 2013. ^ "Aspects of Life During the Neolithic Period" (PDF). Teachers' Curriculum Institute. Archived from the original (PDF) on 5 May 2016. Retrieved 5 September 2013. ^ Gibbs, Kevin T. (2006). "Pierced clay disks and Late Neolithic textile production". Proceedings of the 5th International Congress on the Archaeology of the Ancient Near East. Academia.org. Retrieved 5 September 2013. ^ Green, Jean M (1993). "Unraveling the Enigma of the Bi: The Spindle Whorl as the Model of the Ritual Disk". Asian Perspectives. University of Hawai'i Press. 32 (1): 105–24. hdl:10125/17022. ^ Cook, M (2007). "The clay loom weight, in: Early Neolithic ritual activity, Bronze Age occupation and medieval activity at Pitlethie Road, Leuchars, Fife". Tayside and Fife Archaeological Journal. 13: 1–23. ^ Oliver Dietrich; Çiğdem Köksal-Schmidt; Jens Notroff; Klaus Schmidt (2016). "Establishing a Radiocarbon Sequence for Göbekli Tepe. State of Research and New Data". NEO-LITHICS 1/13 the Newsletter of Southwest Asian Neolithic Research. ^ Mazurowski, Ryszard F.; Kanjou, Youssef, eds. (2012). Tell Qaramel 1999-2007. Protoneolithic and early Pre-Pottery Neolithic settlement in Northern Syria. PCMA Excavation Series 2. Warsaw, Poland: Polish Center of Mediterranean Archaeology, University of Warsaw. ISBN 978-83-903796-3-0. ^ E. J. Peltenburg; Alexander Wasse; Council for British Research in the Levant (2004). Garfinkel, Yosef., "Néolithique" and "Énéolithique" Byblos in Southern Levantine Context in Neolithic revolution: new perspectives on southwest Asia in light of recent discoveries on Cyprus. Oxbow Books. ISBN 978-1-84217-132-5. Retrieved 18 January 2012. ^ a b Ostaptchouk, Dr. "Contribution of FTIR to the Characterization of the Raw Material for "Flint" Chipped Stone and for Beads from Mentesh Tepe and Kamiltepe (Azerbaijan). Preliminary Results". ^ Davis K. Thanjan (12 January 2011). Pebbles. Bookstand Publishing. pp. 31–. ISBN 978-1-58909-817-6. Retrieved 4 July 2011. ^ Developed Neolithic period, 5500 BC. Eliznik.org.uk. Retrieved on 2011-12-03. ^ "Manunggul Burial Jar". Virtual Collection of Asian Masterpieces. Retrieved 5 September 2013. ^ "Tabon Cave Complex". National Museum of the Philippines. 2011. Retrieved 5 September 2013. ^ "NEOLITHIC CULTURE OF TAMIL NADU: AN OVERVIEW" (PDF). Bellwood, Peter (November 30, 2004). First Farmers: The Origins of Agricultural Societies. Wiley-Blackwell. p. 384. ISBN 978-0-631-20566-1. Pedersen, Hilthart (2008). Die Jüngere Steinzeit Auf Bornholm. GRIN Verlag. ISBN 978-3-638-94559-2. 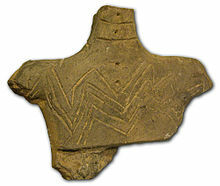 Wikimedia Commons has media related to Neolithic and Neolithic artefacts. McNamara, John (2005). "Neolithic Period". World Museum of Man. Archived from the original on 2008-04-30. Retrieved 2008-04-14. Affonso, T.; Pernicka, E. (2000). 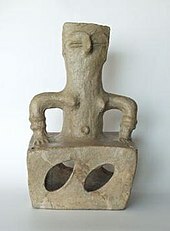 "Pre-Pottery Neolithic Clay Figurines from Nevali Çori". Internet Archaeology (9). doi:10.11141/ia.9.4. Rincon, Paul (11 May 2006). "Brutal lives of Stone Age Britons". BBC News. Retrieved 2008-04-14. "Neolithic" . Encyclopædia Britannica (11th ed.). 1911. The Epipaleolithic Natufian culture existed from around 12,000 to 9,500 BC or 13,050 to 7,550 BC in the Levant, a region in the Eastern Mediterranean. The culture was unusual in that it supported a sedentary or semi-sedentary population even before the introduction of agriculture. The Natufian communities may be the ancestors of the builders of the first Neolithic settlements of the region, which may have been the earliest in the world. Natufians founded a settlement where Jericho is today, which may therefore be longest continuously-inhabited urban area in the world. Some evidence suggests deliberate cultivation of cereals, specifically rye, by the Natufian culture, at Tell Abu Hureyra, the site of earliest evidence of agriculture in the world. The world's oldest evidence of bread-making has been found at Shubayqa 1, a 14,500 year old site in Jordan's northeastern desert. In addition, the oldest known evidence of beer, dating to approximately 13,000 BP, was found at the Raqefet Cave in the Mount Carmel near Haifa in Israel, in which it was used by the semi-nomadic Natufians for ritual feasting. Pre-Pottery Neolithic B (PPNB) is a Neolithic culture centered in upper Mesopotamia. It was typed by Kathleen Kenyon during her archaeological excavations at Jericho in the West Bank. Like the earlier PPNA people, the PPNB culture developed from the Mesolithic Natufian culture. However, it shows evidence of a northerly origin, possibly indicating an influx from the region of north eastern Anatolia. The prehistory of Egypt spans the period from the earliest human settlement to the beginning of the Early Dynastic Period around 3100 BC, starting with the first Pharaoh, Narmer for some Egyptologists, Hor-Aha for others, with the name Menes also possibly used for one of these kings. This Predynastic era is traditionally equivalent to the final part of the Neolithic period beginning c. 6000 BC and ends in the Naqada III period c. 3000 BC. Mureybet is a tell, or ancient settlement mound, located on the west bank of the Euphrates in Raqqa Governorate, northern Syria. The site was excavated between 1964 and 1974 and has since disappeared under the rising waters of Lake Assad. Mureybet was occupied between 10,200 and 8,000 BC and is the eponymous type site for the Mureybetian culture, a subdivision of the Pre-Pottery Neolithic A (PPNA). In its early stages, Mureybet was a small village occupied by hunter-gatherers. Hunting was important and crops were first gathered and later cultivated, but they remained wild. During its final stages, domesticated animals were also present at the site. The prehistory of the Levant includes the various cultural changes that occurred, as revealed by archaeological evidence, prior to recorded traditions in the area of the Levant. Archaeological evidence suggests that Homo sapiens and other hominid species originated in Africa and that one of the routes taken to colonize Eurasia was through the Sinai desert and the Levant, which means that this is one of the most important and most occupied locations in the history of earth. Not only have many cultures and traditions of humans lived here, but also many species of the genus Homo. In addition, this region is one of the centers for the development of agriculture. The Pre-Pottery Neolithic represents the early Neolithic in the Levantine and upper Mesopotamian region of the Fertile Crescent. It succeeds the Natufian culture of the Epipaleolithic (Mesolithic), as the domestication of plants and animals was in its formative stages, having possibly been induced by the Younger Dryas. The Pre-Pottery Neolithic culture came to an end around the time of the 8.2 kiloyear event, a cool spell centred on 6200 BCE that lasted several hundred years. Nahal Oren is an archaeological site on the northern bank of the wadi of Nahal Oren (Hebrew)/Wadi Fallah (Arabic) on Mount Carmel, 10 km (6.2 mi) south of Haifa, Israel. The site comprises a cave and the small terrace in front of it, which steeply descends towards the wadi floor. The site was first excavated in 1941. Kebaran, Natufian (Epipaleolithic) and Pre-Pottery Neolithic A and B industries were found. Tell Aswad, Su-uk-su or Shuksa, is a large prehistoric, neolithic tell, about 5 hectares (540,000 sq ft) in size, located around 48 kilometres (30 mi) from Damascus in Syria, on a tributary of the Barada River at the eastern end of the village of Jdeidet el Khass. The Nachcharini cave is located at a height of 2,100 m (6,889.76 ft) on the Nachcharini Plateau in the Anti-Lebanon mountains near the Lebanese/Syrian border and among the most elevated Natufian and Khiamian hunter-gatherer occupation sites found to date. Abu Madi is a cluster of prehistoric, Neolithic tell mounds in Southern Sinai, Egypt. It is located east of Saint Catherine's Monastery at the bottom of a granite ridge. It was suggested to have been a seasonal encampment for groups of hunter gatherers and contained the remains of two major settlements; Abu Madi I and Abu Madi III. Abi Madi I is a small site with the remains of a partially buried 4 metres (13 ft) building containing deposits up to a depth of 1.3 metres (4.3 ft). Abu Madi III was an area of roughly 20 square metres (220 sq ft) that was excavated close to a large nearby boulder. Dwellings were found to have stone built silos next to them. It was first excavated in the early 1980s by Ofer Bar-Yosef. Beidha, also sometimes Bayda, is a major Neolithic archaeological site a few kilometres north of Petra near Siq al-Barid in Jordan. It is included in Petra's inscription as a UNESCO World Heritage Site. Tell Halula is a large, prehistoric, neolithic tell, about 8 hectares (860,000 sq ft) in size, located around 105 kilometres (65 mi) east of Aleppo and 25 kilometres (16 mi) northwest of Membij in the Raqqa Governorate of Syria. 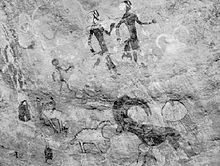 Iraq ed-Dubb, or the Cave of the Bear, is an early Neolithic archeological site 7 km (4.3 mi) northwest of Ajlun in the Jordan Valley, in modern-day Jordan. The settlement existed before 8,000 BCE and experimented with the cultivation of founder crops, side by side with the harvesting of wild cereals. Along with Tell Aswad in Syria, the site shows the earliest reference to domestic hulled barley between 10,000 and 8,800 BCE. The site is located on a forested limestone escarpment above the Wadi el-Yabis in northwest Jordan. An oval-shaped stone structure was excavated along with two burials and a variety of animal and plant remains. Hatula is an early Neolithic archeological site in the Judean hills south of Latrun, beside Nahal Nachshon, in Israel, 20 kilometres (12 mi) west of Jerusalem. The site is 15 metres (49 ft) above the riverbed on a rocky slope in an alluvial valley. Excavations revealed three levels of occupation in the Natufian, Khiamian and PPNA (Sultanian).